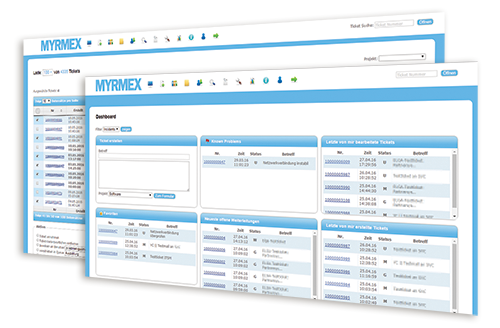 The Service Management and Ticketing tool Myrmex supports your sales and support departments user-friendly and efficiently. Numerous customer requests are incorporated in the development of Myrmex. It assists your service helpdesk with quick ticket processing, the documentation of service processes and the evaluation of measurement data. Myrmex can be used "out of the box" in every kind of company. Ease of use is achieved with simple forms and easily understood functions, which produces greater efficiency and customer satisfaction. Myrmex enables you to offer support around the clock, even if challenges can not be resolved immediately. 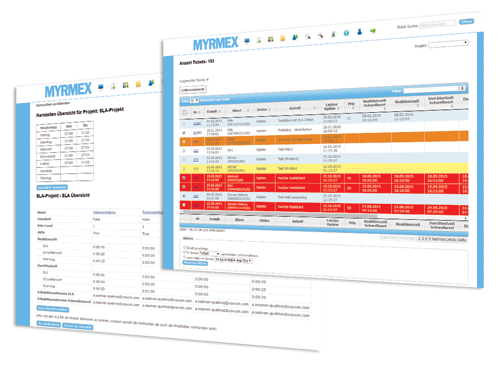 Our ITIL experts equipped Myrmex with automated service management functions. Myrmex automatically detects Problems by analyzing Incident tickets to uncover recurring pattern. Then, FAQ entries and workarounds are offered. Concerning Service Level Management, dynamic thresholds, response and throughput times, as well as escalation scenarios can be defined. Myrmex documents service processes continuously and independentlyin the background. Extensive evaluation tools facilitate measurement of performance of the service desk. By integrating email, fax, chat and telephony directly in one user interface, statistics for all channels are finally made possible.